This undated screen grab taken on July 19, 2017, from video posted by www.uriminzokkiri.com shows North Korean defector Lim Ji-Hyun, who appeared in several South Korean TV shows featuring North Korean refugees after settling in Seoul in 2014, speaking on North Korean propaganda television at an unknown location in the North. The case of a Korean woman who defected from North Korea, made a new life for herself as a TV personality in the South and then "returned home" to the communist state three years later has left South Koreans wondering why such people return to the repressive state they once fled. South Korean police are attempting to determine whether Lim Ji-hyun was kidnapped in April, when she traveled from Seoul to China and then disappeared. A video featuring her was posted last week on North Korea's official website (Uriminzokkiri), and in it she says life in the capitalist South was like "living in hell." Lim, who now identifies herself in the North as Jeon Hye Song, said "a false illusion" that she could earn a lot of money prompted her to defect to South Korea in January 2014. Reality was different, she said in the North Korean video, and she found herself working in bars to get by. Television appearances and starring roles in reality shows made Lim famous in the South, but she now says she was living in physical and psychological pain. From her new vantage point in the North, Lim has denounced South Korea and TV Chosun, which produced the programs about defectors that she appeared in. Despite that, the South Korean public is still fascinated by her, because of intense curiosity about one puzzling question: Was her return to the North voluntary? Another North Korean defector, Kim Ji-young, who appeared with Lim on the show Moranbong Club, doesn't think so. Some past defectors committed serious crimes in the South and chose to go back to North Korea to escape punishment, Kim told VOA's Korean service, but almost everyone else who winds up back in the North was coerced: "Going back to North Korea after living [in the South] is a lot riskier than escaping from there. It's like running into a fire, carrying fuel." 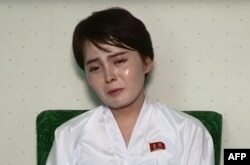 Another Moranbong Club star, defector Kim Ka-young, believes Lim was kidnapped and taken back to Pyongyang against her will. "Why would she go back on her own? Of course she was kidnapped," said Kim. "Every word she said during that interview sounded disingenuous and fabricated." According to Kim Kwang-jin, another defector who now is a researcher at the government-funded Institute for National Security Strategy (INSS) in Seoul, such "involuntary repatriation of North Korean defectors" — particularly from China — is not uncommon. "There are many other cases where North Korean defectors are abducted in China while trying to send money to their families in their homeland," Kim told VOA. Thousands of North Koreans have sought asylum in South Korea over the past decade, and more than 30,800 former North Koreans now live in the South. Since 2012, there have been 25 confirmed cases of defectors who returned to the North; five of those later changed their minds and re-defected to South Korea, according to Seoul's Unification Ministry. The Unification Ministry, which analyzes North Korean media and relies on other sources, said it could not determine how many returnee defectors were forced to repatriate to the North. Greg Scarlatoiu, executive director of the Committee for Human Rights in North Korea, said there are many reasons defectors decide to return. 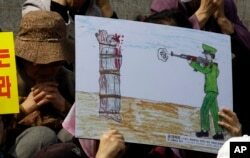 FILE - A North Korean defector reacts next to a drawing depicting a public execution of a North Korean soldier during a human rights rally in Seoul, South Korea, April 14, 2011. Some of them try to rescue family members they left behind in the North, but get caught in the process, Scarlatoiu said. Other defectors became religious believers during their time in the South and headed back North to proselytize, but wound up being detained, he said. And then there are those who were North Korean agents to begin with, who intentionally went south to collect information and then returned home, Scarlatoiu said. One subset of defectors are those "North Koreans who have grave difficulties and somehow, [for] some reason, they live in more isolation than others," the human rights worker said. For these people, their problems feel "so serious, so insurmountable that the only choice ... is to go back." Scarlatoiu told VOA he believes Lim was in this category. Many defectors have encountered hardships while trying to adjust to a society vastly different from the regimented conditions in North Korea. "North Korean defectors face difficulties assimilating into the fabric of South Korean civil society, difficulties derived from significant differences in culture and education levels," the national security institute's Kim told VOA. "I can tell you there are many cases of bullying at schools, and that really affects defectors trying to settle in." Making ends meet can be another major struggle. Landing a stable job is not easy for defectors, whose educational credentials are not accepted in the South, said Kim Sung-kyung, a professor at the University of North Korean Studies. A North Korean refugee who now lives in the United States, Joseph Kim, said some defectors may feel obliged to return if the North Korean regime threatens to punish family they left behind. 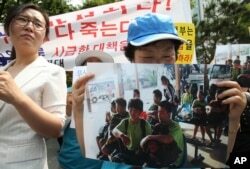 FILE - An unidentified North Korean defector holds a picture of nine North Korean defectors who were flown home as she cries during a rally protesting Laos' repatriation of them, in Seoul, South Korea, June 5, 2013. Many defectors and North Korea experts say South Korea could do more to ease the dislocation that North Korean defectors feel. They suggest that defectors cleared by the National Intelligence Service could stay for longer than the standard 12 weeks at the government's support center, Hanawon. Another proposal is for more and better vocational training. "In addition to providing resettlement funds, there should be more efforts on the part of the government to establish programs that help defectors learn skills to support themselves," said Cho Han-bum, an analyst at the Korea Institute for National Unification, a government-funded think tank. On average, Seoul gives each North Korean defector about 5 million won, or $4,200, to help with resettlement. Some South Koreans — even former defectors like Kim of the Moranbong Club reality show — think the North Koreans should make a greater effort to fit in. "Reaching out to someone for help is not something they should feel ashamed of," Kim said. "I think there's no one who will turn a blind eye to their suffering if [the defectors] ask for help." Jenny Lee contributed to this report, which originated on VOA Korean.